While playing 4-on-4, Oskar Sundqvist broke in 2-on-1 with Jay Bouwmeeste and moved into the right circle before firing a wrist shot under the arm of Connor Hellebuyck and in. Mark Scheifele took the puck behind the Blues net before feeding Blake Wheeler at the top of the crease. Wheeler fired the puck over the glove of Jordan Binnington and in. While on the power play, Blake Wheeler fed a pass from the right wall across to Patrik Laine in the left circle. Laine one-timed a slap shot blocker-side on Binnington and in. 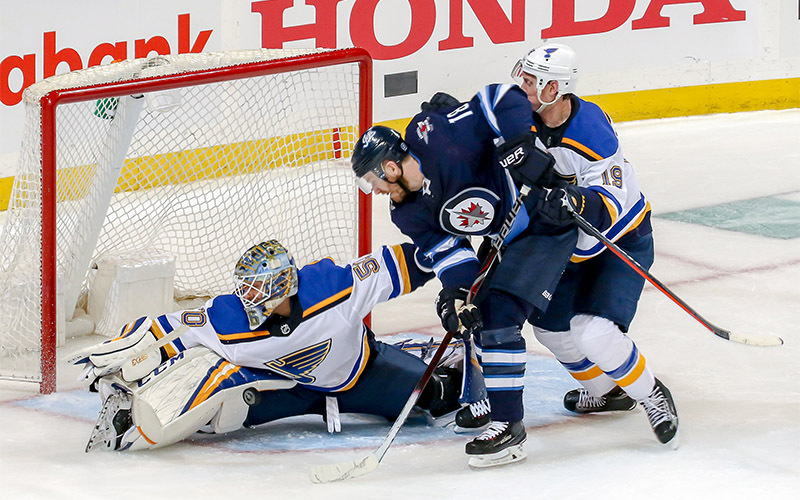 After Connor Hellebuyck made a save, Robert Thomas gathered the loose puck and took it behind the net before sending a pass in front to Patrick Maroon, whose shot hit Hellebuyck, but trickled just over the line and in. Joel Edmundson fed David Perron at the Jets blueline. Perron moved in over the line and dropped a pass to Oskar Sundqvist, who moved just inside the right circle before snapping a shot through the legs of Connor Hellebuyck and in. While on the power play, Dustin Byfuglien sent a pass to Kyle Connor near the right corner. He quickly fed Mark Scheifele in the right circle where Scheifele ripped a shot blocker side on Binnington and in. Ryan O’Reilly took a pass from Jay Bouwmeester at the Jets blueline, moved to the top of the right circle and let a wrist shot go that beat Hellebuyck blocker side. Jets trail in the series 2-0. It’s the third time in franchise history the Jets have trailed two-games-to-none, and first time since losing Game 2 to Anaheim Apr. 18, 2015. Jets went 2-for-3 on the power play tonight. Jets penalty kill was a perfect 4-for-4. Were outshot 32-29 tonight and have been outshot in each of the first two games. Registered his first goal of the playoffs, opening the scoring for the Jets tonight. Wheeler had three goals in 17 games in the 2018 playoffs. It’s the ninth time in his career that Wheeler has registered a multi-point playoff game. Scored his first of the postseason tonight. Scheifele led the Jets with 14 goals during the 2017-18 playoffs. Registered his 10th career multi-point playoff game. Registered the secondary assist on Wheeler’s first period goal for his first point of the playoffs. Copp had two assists in 16 games in the 2017-18 playoffs. Scored his second goal of the 2019 playoffs and has now scored in consecutive games. Led the Jets with 26:26 TOI. Finished the night with two assists and now leads the Jets in scoring with three assists in two games. Had the primary assist on Scheifele’s power play goal to pick up his first point of the playoffs. Led the Jets with six hits tonight and has registered six hits in each of the first two games of the playoffs.